It is time for Mother Nature to switch things up a bit… It is a sweet transitional time! At its end, Winter can seem stark and relentless, while Spring is kind – filled with color and light. Not to say that I didn’t enjoy these past few months. For instance, this winter, I started snowshoeing (so fun)! I really enjoyed cozy nights in fuzzy pajamas and fluffy socks spent binge watching Netflix or HGTV while sipping hot chocolate or wine and baking… I still disliked driving in the ice and snow, the freezing cold temperatures, and shoveling, but aforementioned activities allowed me to enjoy winter a bit. Well, now spring is here and it just doesn’t feel right sitting in front of the TV wrapped in layers of warmth, while there is so much ore daylight to enjoy. The time has come to bid farewell to our comfy friend “Winter” for another year and to welcome our pastel pal, “Spring”. To welcome each new season, I create a “Bucket List”. This consists of activities or events that I want to participate in over the next few months. The list can include simple pleasures, long awaited getaways, and anything in between. Plant a garden – I look forward to this every year! I start in early Spring by cleaning the landscape and preparing the soil. Then, I start planting and pruning flowers. (Bleeding hearts, peonies, hydrangeas, and lilacs are among my sentimental favorites to grow!) I also start my seedlings in a small greenhouse… Those will be planted in the garden later. I am also working on propagating some succulents! I’ll keep you posted how that works out! Day (or overnight) Trips & Exploring – New York City, Block Island, Provincetown and more. Exercise Outdoors – The perfect time to lace up my sneakers and head outside to get my blood pumping! What is more therapeutic than running or biking while you enjoy a beautiful view? Or practicing yoga on soft grass in the fresh, clean air? Or discovering new place during a hike? I enjoy a good gym sweat session, but I try to get outside to move as much as I can. Put out my Hummingbird Feeder – Okay, this may seem like a little thing, but I LOVE watching the hummingbirds fly around all Spring and Summer! The tiny birds are unpredictable, fast and a lot of fun to watch! Simply fill your feeder with sugar water and place it near a window or near your outdoor seating area. You can even place some red flowers near the feeder to increase the likelihood of a hummingbird! They LOVE the color red. That is my list, so far! I am sure that additions will be made! What are you looking forward to most during the Spring? 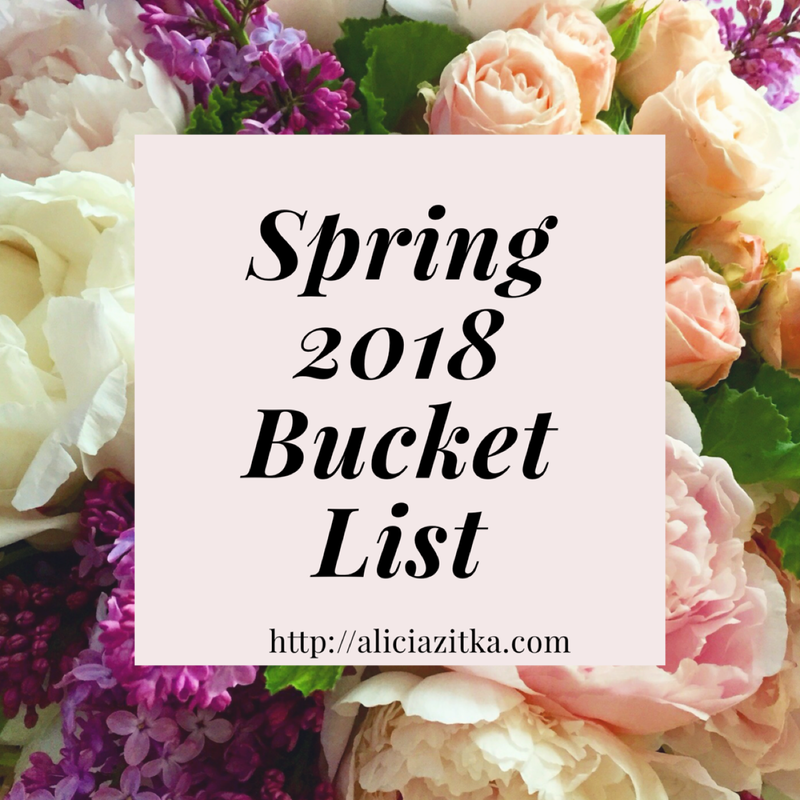 What is on your Spring 2018 Bucket List?